Dental Dam is a line of 13 varieties of dental dams. One non-latex option is available in peppermint flavored, medium gauge, purple 6”x6” sheets. The latex options are green (peppermint) and blue (unflavored), each available in 5″x5″ or 6″x6″ sheets in thin, medium and heavy gauges. The latex dam material is manufactured from medium modulus natural latex and is 100% non-chlorinated as well as being powder-free (less than 5mg/sheet) and low-protein (extractable protein content is below FDA allowable claim limit of 50ug/g per sheet), which reduce the potential for allergic reactions associated with latex products. 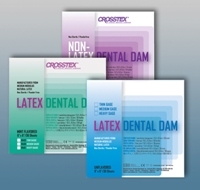 Dental Dam is supplied in 52-count boxes of latex or 15-count boxes of latex-free sheets. It is appropriate for all operative dentistry procedures. 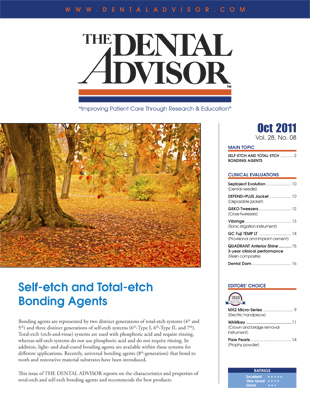 Dental Dam in medium gauge was evaluated by 22 consultants in 761 uses. It received an 87% clinical rating. Dental Dam is available in an excellent selection of sizes and gauges. It adapts well to teeth and is easy to place. Since only the medium gauge was evaluated, there were varying comments from consultants, depending on their personal preferences. Some consultants found it ideal, while others experienced tearing. The latex dam has a great amount of stretch and inverts nicely around the teeth. Thirty-six percent of consultants reported that Dental Dam was better than their current dental dam product and 32% reported that it was equivalent. Sixty-eight percent would switch to Dental Dam and 73% would recommend it. Lubricate the holes on the dam before placement to make it easier to floss through the contacts.